I know. The title makes me sound like my grandmother, who simply meant say “please”, use “may” not “can”, and always end with “thank you”. But today, I find that people are more comfortable manipulating, not asking. I didn’t know Jesse Robredo. I may have met him once and that was that. But I first heard his name in 2005 as we worked on the Karangalan Festival. We were looking for people in the different sectors of society who were serving honorably, effectively and with integrity. His was pretty much the only name we considered for government. Since then I have been a fan in the sidelines and so I was surprised at the depth of my pain when I first heard of the plane crash. I had hoped against hope that he had been quietly making his way back home on a bangka, perhaps a bit battered and bruised, but none the worse for wear. The depth of grief that continues to dwell in my heart and the heart of most every Filipino is almost inexplicable. I realize so many of us felt comfort that he was here, in our corner of the world, and where he was there was good. In him, we saw who we could be. Like many, I also held hope he would one day run our country and finally be the force that would inspire us to be our best. Always. As I watched his wife Atty. Leni Robredo speak yesterday, I realized that we lose good people also so that we may know their full story. There was so much more good in Jesse Robredo that would have remained private, had he not passed on. He was a good family man and husband. You could tell his marriage was authentic, living and true. Theirs was a marriage that was not about them. Service was at the center of it. I know no other formula for the longevity of a male-female bond than that. They had it and they lived it. They lived simply and with integrity. They both did such good work that was so apparent they didn’t have to spend to put their initials, names and faces on tarpaulins, sidewalks, benches and billboards. His work was on the ground. Everyone knew him and they could feel and see his deeds at work. Why do the best ones go first? This is a question so many have asked in the last few days. I think it is so their light can inspire us to rise higher and do our share. Through his passing we see so much goodness. I am in awe of his wife, Leni. She is the epitome of dignity and grace. She also shows us that there is no need for drama, hysteria, bitterness, but how grace and acceptance can heal and unite. There is so much inspiration to draw from now and I believe that sometimes that is what death brings–a quality of light that allows us to see with more than our eyes. Jesse Robredo’s life and death show us that service, honor, integrity simplicity–a life of good–crosses borders and goes straight to the hearts of people far and wide. Last night, my son brought in the blank book he bought at a recent yard sale. He was treating it as a most priced treasure that he didn’t want to use. He finally found something worthy to put on its first page. Even children feel the need to honor Jesse Robredo. Salamat, Jesse, for showing my children that good Filipinos continue to dwell and serve among us. In life and in death. They must regret opening an online store in the Philippines. I needed an extra wi-fi router so D. told me to order online. His experience with them has been stellar: quick, efficient, stress-free. I don’t know what happened between then and now, but that has not been my experience. Since June 7, Manila has been the cause of delay. Poor Apple. I hope it doesn’t give up on us. A well-organized space is a sight to behold. It makes me want to dance. This is true of our internal spaces as well. How often have we foisted our emotions on the wrong people, at the wrong time and for all the wrong reasons? Just like our outer spaces, our emotions need organizing. There are times when our emotions become bigger than us, because we fail to see them objectively. I suppose it’s normal. It is difficult to see ourselves objectively and emotions do tend to run away from us, but that’s why it’s so important to make an effort to put them where they belong. Recently, a parent nearly traumatized his child over schoolwork, when his frustration was really directed at the child’s school and what he felt was their negligence in providing him with the proper foundational skills. He was angry at the school, but he let his anger leak out towards his child. Did that solve anything? No, it created more pain. That’s what happens when we are not conscious of our emotions and WHERE they belong. We can live with our emotions for years until they become habit. We are angry, very angry, but we don’t really know why anymore, or where we ought to put it, so it leaks out everywhere until we bubble up and burst, causing irreparable damage everywhere. What a mess we make when we let our emotions rule us. If we are aware of our points of anger, rage, frustration and pain, we can make an effort to examine them–with the goal of seeing them objectively. Where does it belong? What was the source? Am I taking it too far now? Have I let it become bigger than it is? Is it time to put it to rest, or do I need to dust it off and re-shape it? Where does it belong today? It’s easier said than done, I know, but it’s a useful practice and one that allows us to manage our emotions, rather than the other way around. I grew up with very volatile, emotional people and that taught me to be the opposite: organized, methodical, cool, calm, because I know that big, obtrusive emotions can wreak indescribable havoc. As an adult, I had to adjust by telling myself it’s okay to be angry and hurt, as long as I don’t inflict it on others. I am still working on that and it helps me to have a picture just like the one I posted above. I tell myself that as long as I can put my feelings and emotions in context, I will not behave abhorrently towards others. That’s the goal, really, to make sure we do not impose our emotions on others. Emotions can be so powerful that we tend to think they are RIGHT, and sometimes this leads to misplaced indignation. But, emotions are only arrows that give direction. There is no right or wrong there. I believe they are indicators of what we need to look at and work on in our biography. And it would do us well to pay attention, take a step back, breathe, and later on see where everything belongs. Wouldn’t it be great if our inner spaces could look organized, yet creative, orderly yet unfixed? Okay, so the words above are extreme, but we know (especially if you snickered) that there’s some truth there. BE CONSEQUENT. These two words sparked a flame in me last week. When I heard it, I knew it to be the very phrase I’ve been looking for. It was spoken in the context of religion. Our priest was speaking to some parents who were considering having their children receive the Sacrament of Confirmation in our church and he was trying to give them a picture of what that meant. There is no dogma in my church–perhaps the only dogma is freedom of thought–so, we would certainly not prohibit people from other religions to participate in the Sacraments, but certainly it is only right that anyone who wants that would have to be awake to what he was doing. At the very least, one should be clear about the consequences of their choices. The words were spoken again by a mentor of our school, in the context of teaching. As a teacher, one must be consequent. If you say something, mean it and follow through on it. This is major for me, because it presupposes an active inner education. To be consequent, one must be clear in thought and intention–in whatever you do or say, you are clear about why–and then you release it in the classroom and because you were clear about your intentions and were purposeful, you can be active and consequent. Today I said it to someone because I spent a big chunk of my morning trading texts. One party said she had been approached and asked to support an initiative. The other party said it was jokingly said. Well, clearly, the joke was not taken as such. So I wanted to point out that it’s so very important to be consequent about what we say! Were you joking or were you hoping? If what you sincerely wanted was help and support, why would you joke about it? Consequently, how can you expect full support if the energy you used to seek it was cloaked in a joke? Part of this, I know, is cultural. We are the kings and queens of passive-aggressive behavior. We love to make “parinig”, asking questions we don’t really need answers to when what we really want is to show people how knowledgeable we are, for example. Or we’ll not look at a person but talk about them anyway, cloaking the discussion in something or other, when what we really want to do is point out their weakness or fault. The truth is it’s so much healthier and more respectful (though, admittedly, not easier), to address the person and lay it out, preferably with warmth and empathy, so that the person on the receiving end can feel safe, especially in a situation of conflict. I find that people are reluctant to step forward with their requests, wishes and intentions as well. They don’t want to be responsible for them. So they like to say they just “jokingly” mentioned something, but in truth they were asking for something. Their true hope was for the other party to read the request and fulfill it. I find that unfair to the person from whom they are soliciting help. Instead of taking full responsibility for your actions, you are transferring the burden to him. There’s nothing wrong with soliciting or asking for help, but one must be clear and able to really ask for it with full conviction, responsibility, transparency, honesty, uprightness and intention. Yes, all that. If you want something, ask for it and be fully behind what you ask for. It shows the person you are addressing that you value his help enough that you would stand before him forthrightly. That’s how much you believe in what you’re asking for. So show it. There is so much murkiness in social relations today because of this. We are not clear when we say things. We might say we are just joking, but really we are not. We ask a question when what we want is to point a finger at someone. And this begins a chain of murkiness, at the end of which blooms cold conflict, because the premises are tangled up in unclear agenda. If we are consequent, or try to be, then we start from a place of clarity. We can only be consequent if, at first, we are clear. Be clear. This is a lifelong task, I know, but if we remind ourselves and work on it, we can always be clearer than the last time and that is progress!! It takes a lot of inner listening and mirroring, and being honest with oneself about what our true purpose is for any undertaking. When we are clear, it is so much easier to be consequent. Be clear. Be consequent. I just know this will change our lives and the world for the better. This year, I thought it was time to make an effort towards connecting my children with their history and their lineage. When I use the word “lineage” I don’t mean it in a haughty, blue-blooded (yeah, right) way. I believe that to be judged by blood is a thing of the past and today, what truly counts is a life measured by deeds. Having said that, I also don’t think it’s right to ignore one’s heritage, the way I tried to, because I just felt that if people found out I was a Rizal descendant, I would simply fade away in comparison. We are descended from Maria Rizal. Her son, Moris, was the father of our beloved grandmother, Fe Arguelles Cruz, whom we fondly called Lola Ba (short for Lola Taba, I kid you not), which later morphed to Mamoo. Moris was nephew and student to Rizal. 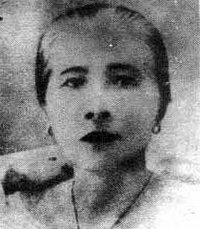 For the longest time, Mamoo kept a letter of Rizal’s to Maria, telling her of her’s son’s progress during a summer spent with him in Dapitan. Every so often she would show us this letter and tell us other stories that were passed on by her grandmother and father. 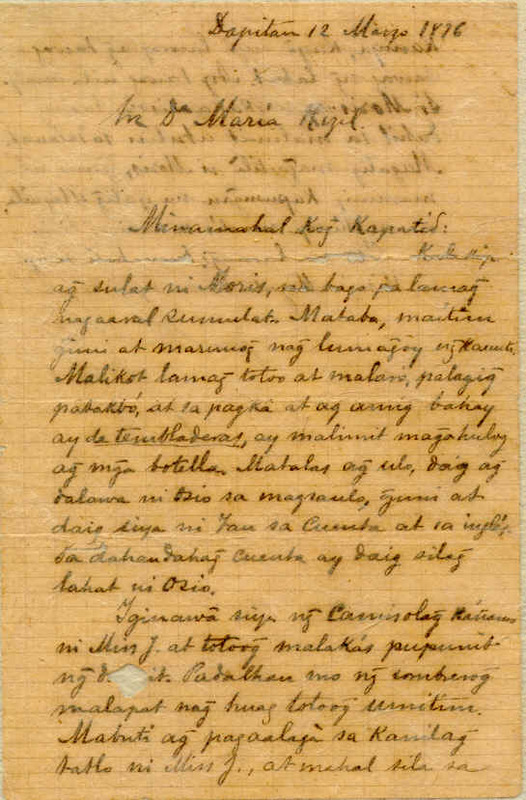 (translation here) The letter has since been donated to the Ateneo. 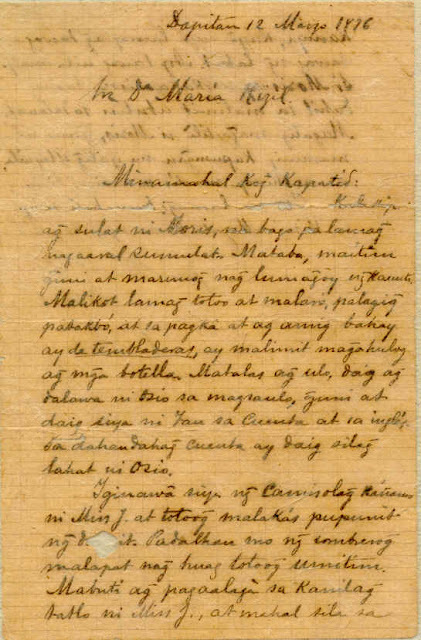 This letter was the only true connection I ever felt I had with Jose Rizal, whom Mamoo referred to as either Lolo Jose or Lolo Rizal. I can count on one hand just how many Rizal family reunions I have attended, but now that I have my own children, I feel it’s time to hear the stories again and inspire them to find the Rizal in them, as every Filipino should. This year, I brought my youngest son, Jose Andres (yes, named after both heroes because I thought it was a good way to put all the discussions to rest), to two events: the visit of President Aquino to the Rizal shrine at his residence in Calamba and then the family celebration at Fort Santiago at night. It was a full day! We started our day early, as the invitation specifically said the President would arrive at 8 a.m. We were there well before and were very happy when the President arrived ahead of time as well. President Aquino does a brief round of handshakes with the family. The ceremony at the Rizal Shrine was short, sweet and well-organized. When we got to the second floor of the house, my mother immediately took my son to the window and told him to pay attention, because on the 200th year celebration, it would probably be his turn to participate in the program. At that moment I felt my task as a mother was done. It’s enough for my son to get a glimpse of what it means to be descended from the Rizal clan. It does not bring a sense of entitlement or superiority (heaven forbid), but a sense of responsibility to make sure that there is continuity in the family. Last night an aunt said that it was time for the Catholic Church to apologize for its transgressions against Rizal and the people of Calamba who were evicted from their homes during his time. Another relative spoke about the work that needs to be done do document all the writings and work of Rizal, making sure that everything is in place, well-preserved and cared for. And who painted the house green? ;p Different family members had their own ideas of what project they might take on. It is not for me to say how my children will choose to participate in this part of their heritage. It is enough for me to make the connection. What is important is they know it is there as just one part of who they are, but the rest of the work, of laying down deeds as their life’s work, that is all up to them and no amount of blood ties will matter then. In the end, it is what we do with our lives that makes us who we are. Everyone has Rizal in them. Everyone. I loved being able to share this moment with my son on this day in history. I am happy to be connecting with Rizal as an adult again. I have been living with so many questions about who I am as a Filipino, and what my deeds this far in my life have amounted to. His 150th year has roused me from inner lethargy. I hope this time the journey is more lasting.